I get this urge to buy baby potatoes every time I see them. This time when I went to Indian store, I saw very fresh looking baby potatoes which looked so beautiful that, I had to buy them. Soon after coming home, I went through my collection of potato recipes. There were so many good recipes and I was not sure what to pick up. Finally I zeroed on this Tandoori aloo. The name comes from the special kind of oven, called Tandoor, used to bake these alus(potatoes). But these can be prepared in normal oven or on stove top. This is a super easy dish. I could not make a uniform coating on the potatoes because my blender/mixer does not allow me to grind anything without putting water. But since the potatoes were pricked and marinated well, they tasted absolutely awesome. You can also add a pinch of red color to make them look bright red, but I don’t like to add any artificial color in my food. So I thought of leaving it as it is. 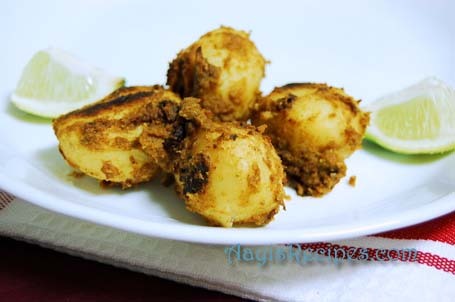 This is my entry to Vaishali’s JFI potatoes. Prick with a fork or put some deep slit marks with a knife on all the potatoes. Grind onions(preferably without water) to a smooth paste. Add onion paste and all other ingredients, except oil to the potatoes and mix well so that the potatoes get a thick coating of potatoes all over. The yogurt should be very thick so that the mixture remains thick. Leave the potatoes for around 1hr. Heat oil in a non stick pan and add the potatoes with the masala. Close the lid and let it cook on a low flame for around 15mins. Preheat the oven at 350F for around 5mins. Take the potatoes in a greased bake ware and broil at 350F for around 10-15mins(till the coating has turned brownish). Tantoori Aloo looks yummy!!! !Please send me some. Thanks for sharing. Wow!! !wonderful entry for JFI…..Looks awesome..
Looks great Shilpa. Somehow when we say Tandoori,we always think bright red dishes.This is a great change,recipe sounds wonderful. Very nice recipe Shilpa! Must try sometime soon…. can it be tried with normal potatoes cut into bite size pcs.? Nice picture. Great recipe…..a perfect entry for Jihva. Shilpa….Like your baked cauliflower this looks yummy. I will buy them on the weekend and try it. Thanks for posting. Sushma, I had read many recipes with broiling involved and also we have this option in oven. I never tried broiling, so I broiled this. They turned out very good. MT, let me know where to send them :). Thanks Usha. Tandoori dishes are my all time favorites, so I thought this would be suitable for JFI. Asha, yes you are right. I used to try to make them red by adding more chili powder. But they used to turn out very hot. So this time I thought of leaving them without tweaking. Thanks Sangeeta. I am glad you liked it. Yes Manasi, you can cut the potatoes into big pieces and use instead of baby potatoes. Since I had baby potatoes at home, I used them. Don’t forget to prick the potatoes well. Thanks Manjula. I spent a lot of time thinking what to send for JFI. Thanks Latha. This tastes delicious too :). Thanks Swapna, let me know if you try it. Seema, let me know how they turned out. Thanks Aruna, I am trying to use oven for baking some dishes other than cakes. Came across this site recently. i must say i will now acess this site regularly and have also recommended it to all my friends. I went through a lot of ur recipes. Iam from karwar and quite a few of the traditional dishes tht u have posted are known to me. I will definitely try the tesri wada here sometime. thnx for tht. And i also have an amzing recipe for Dum aloo. will post it soon if u want. But i dont have foto of tht. That’s a wonderful entry. Nice picture, Shilpa. I like Tandoori recipes. Tandoori alu sounds so tasty. You always come up with good ideas. Oh my god I am just going to crash down while reading and viewing Tandoori Alu, It’s Holi today and since morning I am eating just eating Puranpolis and Telpolies with milk and Tup , all sweet and sweet items. can I have the recipe for mangalore charmure(Puffed rice) upkari? My friend wants it. Thanks a lot Madhura. I have a recipe of dum aloo on this site. But will surely love to have a look at your recipe. If you don’t mind, please send it to my mail id(which is mentioned at the top). Thanks Linda. Let me know if you try this dish. Thanks Sailu. I am taking inspiration from you to take good pictures :). Bharghavi, thanks. I have a very good collection of Kannada magazines which has hundreds of good recipes. That is one of the resources of recipes for me. Harekrishnaji, you are making my mouth water. Puranpoli, telpolies…slurp slurp. Wish I was in India for holi :(. Neelu, churmure upkari?? never heard of it. Though I knew few recipes which might be the one you are looking for. I will see if I can get some churmuri here soon. chumure upkari is sold in karstreet Mangalore opposite venkatramana temple. it is made in konkani households. It tastes different from bhel and coconut oil is used.now many adpotions of the origional recipe are made with adition of tomato etc. but I want to know the origional recipe. I guess some konkani people frequenting your blog must be able to provide it. I made this today for lunch as starter and it was fabulous. My guests enjoyed it very much and asked me to make more next when they come. Thanks again. Neelu, Aruna has this recipe and I will get it from her and post it soon. Aruna, Thanks a lot for trying it out and letting me know. Sandeepa, please let me know how you liked it. Tried Tandoori Aloo yesterday.It was very good. My hubby loves potatoes ,but i didnt expect him to finish 7-8 potatoes at one go ! But I had to broil for longer time around half an hour (even then some potatoes(bigger ones) werent cooked well in the centre part).Next time i ll try cutting into cubes and preparing them.Wonderful site! Thanks for all the lovely recipes. Hi Swarna, as I mentioned in chicken tikka recipe, fry the marinated aloos on stove top in a flat bottomed pan till they are 3/4th done. Then pop them in oven so that they will get cooked evenly. Also, don’t forget to prick them well before marinating. I have been follwing your blogs for quite sometime and today I felt I should write to you. You have taken such a great effort to put these recipes out with wonderful pictures. This website is so awesome… it helps people who work and have to go home and ‘think’ of dishes to make, i have started checking your link to see if i can get ideas to make for that night. Thanks again and keep up the good work! Just now started learning cooking with the help of yr website. Started with starter Tandori Alu. It has not come out well and i cooked aloo for around 25-30 min (in stove). It was tasting kinda of bitter. No idea wat happened. Will you pls help me out in this. Shilpa: Sushma, did you change anything in the recipe? Did you see any green patches on the potatoes? Nope :(. I haven’t changed anything and not found any green patches on it. Still i don’t no what happened. Let me try once again & let u know. Shilpa: There is nothing in the recipe that would make it bitter. I am really surprised. Do not cook the masalas for a long time. If your potatoes are very big, cook them for sometime in water and then follow the recipe. can the tandoori alu be made without the last step i-e without baking? ?is it not sufficient its cooked only on a non stick pan?? My Gos! what alovely blog…Congrates.I will halp in giving items for kids lunchbox. and also I will put some from yr blog on my blog but in my language…Gujarati. i would like to see some vrat recipes and specially without garlic,ginger and onion . i tried this recipe with big potatoes, cut them into big pieces.It tastes too try and seems like no flavour went into the potato. Another time when i tried this recipe with a bit of mashed potatoes, it turned out better,though they were over done, so got mashed. What must I improve in the recipe, it didnt turn as good as the comments here. Shilpa: Prick the potatoes all over by a fork or knife. thank you so much for posting the recipe on this site, i was looking for this very badly , i had a vague recipe of the baby aloos but was finding for a good one as i had got baby alooes some days back and was searching for recipe to prepare curry out of it. thanks once again .hope u post more such different recipes as the ordinary ones you get it any where but such as baby aloos. Hi Shilpa, your recipe looks absolutely delicious! I was just wondering if this dish is meant to be eaten with any form of flatbread (naan,chapati) or if it is meant to be eaten as more of a finger food? I am always looking for dishes that are delicious yet simple, as we are all busy trying to accomplish so much. If you would kindly respond when convenient. Thanks! Shilpa: Lisa, this is served with chapathis/rotis. i want to know what is broiling?